This page is aimed at helping English-speakers trying to find work in Spain with the emphasis on finding a job in Spain in 2019. You are most likely from overseas such as the United Kingdom, America, Australia or another European country and you are planning on moving to Spain. If possible you want to get a job offer before you make your move and relocate. So basically you are an expat looking for popular jobs vacancies in Spain and you are regarded as a foreigner in Spain. We like to think of ourselves as the complete resource for finding work because with us you can list your jobs wanted or your vacancies if you are an employer. Basically we are a job centre, employment agency and recruitment agency rolled into one. Staff Required? 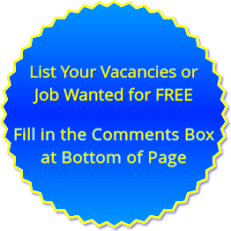 Employers – please list your jobs in Spain below – IT IS FREE!! Please leave your details below in the comments box if you WANT TO WORK IN SPAIN!! Even better is to leave your comments on the most relevant job-specific page we have – see list on right. Just wanted to add some info for people. I have lived and worked in Benidrom myself. And left due to serious illness in the family forcing me to return to care for them. The advice on this site is very honest. YOU MUST SPEAK SPANISH. No matter what you wish to do, i.e. work for an English business, or one whom deals with English people. You’re in Spain, you NEED to speak Spanish!! You need to order food, drink, give directions to the taxi driver, deal with police, hospital, dentist, and what about getting the Electric bill sorted, and water, council tax, and how about getting the phone and broadband connected?? and then, what about when it goes wrong etc. You’re in Spain, it’s not for them to speak English, but you to speak their language. When English people find someone who does not speak English in the UK, be that someone whom lives there, Polish for example, or on holiday – you just shrug your shoulders at them and move on. EXPECT THE SAME WHEN YOU’RE IN SPAIN! Posting and looking online will not get you a job. Being there. Talking to people. Meeting people, will find you work. Every job I ever had, was found by knowing someone. Get your documents. NIE for example. Some many work without them illegally – but it’s not in your interest. You need a foot print, a history to be able to claim benefits, pensions etc. Expect to work hard. More than you’d think! At one point I had something like 8 different “jobs”, and often was working in a shop, doing something that wasn’t related to the business. Spanish Unemployment is Over 27% – Can I Really Find Work? When looking for job opportunities in Spain you may need to lower your expectations of what type of work you can find. We know you want to find the best paying jobs and no doubt you have dreamed of a better quality of life but you must realise in advance that unemployment is high in Spain at over 27%. Job opportunities are limited and much lower paid than in Northern Europe and the USA. Working in Spain can be very hard and low-paid. If you are moving to Spain and looking for a job then you are immediately at a disadvantage due to the language barrier. Our immediate advice is to learn some basic Spanish. Even if you speak fluent Spanish (Castellano) many regions of Spain have their own dialects – for example in the Costa Brava (Barcelona) area they primarily speak Catalan. Even if you are fluent in the language, in Spain most jobs are given to locals who are often close family members or relatives. Competition for a job with a contract, which comes with an entitlement to medical care, is intense and employers can afford to be very choosy. There are many illegal immigrants from North Africa and Eastern Europe competing for low-paid, menial job positions. As a foreigner competing against Spanish nationals for jobs you are immediately at a disadvantage when looking for work and certainly it would be best to concentrate on looking for English speaking jobs in Spain. The most common types of English jobs on offer will be bar jobs, construction and buildings jobs, sales jobs and jobs in the travel and tourist sector such as hotel jobs, driving jobs and catering jobs. At least if you are from the United Kingdom, as an European Union citizen you won’t have the need to obtain a work permit and apply for a residencia, something which many Americans, Canadians and Australians who want to work in Madrid and Barcelona have to overcome first. Also most UK qualifications will also not be recognised in Spain. If you know exactly where in Spain you wish to search for situations vacant, then you can search by regions in which we have specific pages on the most popular towns and cities. These guides give you an idea as to what sort of jobs you can expect to find advertised as well as an overview of the town or city – after all – while finding work is important, it is also just as important to choose somewhere good in which to live in which you can enjoy a better quality of life. Spain is a large country and there are very big differences between the various regions. The Costa del Sol is probably the best area of mainland Spain to search for jobs. This very developed coast is the most popular area of Spain for tourism and has a large expatriate population and arguably the best climate in Spain which makes it a lovely place to live. The very good weather contributes towards a longer tourist season which is a help because these do tend to be the most popular types of jobs and include work in hotels, cleaning villas and apartments as well as the usual bar and restaurant type positions. Our most popular Costa del Sol locations for finding work include: Marbella, Malaga, Fuengirola, Nerja, Torremolinos and Benalmadena. There are also plenty of other smaller towns and resorts along the Costa del Sol but they are very much smaller places with fewer opportunities. This is also a good area for Spanish golf jobs such as caddies and golf pros. Slightly less popular are the Costa Blanca and Costa Brava areas which tend to comprise a series of former fishing villages with good sandy beaches but less job possibilities. The best places to find jobs on the Costa Blanca include Torrevieja, Benidorm and Alicante while on the Costa Brava the extremely popular tourist resort of Lloret de Mar is a good choice as is Tossa del Mar, Sitges and Salou. The best areas in Spain to find jobs for professionals and executives would be the major cities of Madrid, Barcelona, Valencia and to a lesser extent Seville. In these Spanish cities you will find offices of major multi-national companies. There are good opportunities for working here in IT as computer jobs do not require many Spanish skills. If you are searching for summer and seasonal work then look at the islands of Spain which has more of an all year round season due to better weather and climate. This would apply more to the Canary Islands than the Balearic Islands as the Canaries are closer to Africa than mainland Spain. If you want long-term work in Spain and not just seasonal work look to the Canary Islands of Tenerife, Lanzarote, Fuerteventura and Gran Canaria (with the most popular resort being Playa del Ingles). The Balearic Islands are also very popular especially Ibiza and Majorca/Mallorca (with the most popular resort for jobs being Magaluf). Ibiza and Mallorca are full of possibilities for jobs as holiday reps, bar jobs, dancers, pr jobs, DS’s, waiters, waitresses, chefs, restaurant jobs, hotel jobs and many other tourism related situations vacant. The islands are also good for water sports and marine jobs such as dive instructors, windsurfing teachers, sailing, crewing and boat maintenance. If you are searching for work in the year 2019, be sure to subscribe to our latest job alerts by putting your name and email address into the special newsletter box (top right of page). If you are from a European Union country you are fortunate that you are entitled to work in Spain without applying for a visa. Other foreign nationals such as Americans, Canadians and South Americans must get a visa in advance of their stay in Spain which will last three months. Do I Need a N.I.E. Number? Many people in Spain are employed illegally, without a contract and therefore do not need a NIE number. This number is your tax identification number in Spain (Número de Identificación de Extranjeros). To get an N.I.E. number in Spain, go to local police station or social security office and fill out the necessary forms. Some basic details are required such as address, name, passport number etc. Obviously the form is in Spanish. You should be issued with a temporary card on the spot. Helpful information on getting NIE and residency in Spain. We are always being asked – what are the best paid jobs in Spain, what job offers are available and how much can I earn in Spain? It is generally recognised that wages and salaries in Spain are lower than most other European countries however the cost of living is also comparatively lower. The Spanish also tend to work very long hours due to the traditional siesta break in the middle of the daytime. Always try to get the job that comes with an official working contract as this entitles you to state health care. With a contract your employer will have to contribute social security payments on your behalf. The only other way you will be entitled to free health care is if you become self-employed and pay into the social security system yourself. For example if you have a salary of £30,000 and you find an equivalent job position in Spain you may be paid about €20,000 – and although the cost of living in Spain is lower – it isn’t that much lower! If you are in a legal job your employer will deduct national insurance (social security) and tax from salaries. Not only do jobs in Spain pay less you also tend to work longer hours. Most jobs start at around 9am some 10am with a long lunch break of two hours before resuming until 7pm or 8pm. While you may have a long lunch hour for what is known as siesta time – if you have a young family then that is no consolation as you won’t see them much until the weekends. It’s an unfortunate fact that many people who come to Spain searching for employment, a job and a better quality of life end up finding a job that is low paid and comes with longer working hours than they used to work back home. Many people end up disillusioned and end up leaving Spain for financial reasons. Be prepared to be flexible and completely change career direction. Most job vacancies are found through word of mouth and in local newspapers. You will find the best possibilities for finding English jobs would be in the coastal areas which have large expat populations and therefore companies catering to the needs of these expats. These areas primarily are the Costa del Sol (especially Malaga, Marbella, Nerja, Mijas, Fuengirola, Benalmadena and Torremolinos areas) and the Costa Blanca (Alicante, Torrevieja, Benidorm jobs, Calpe, Javea, Moraira and Denia areas). To give you an idea of the most popular areas of Spain that people speaking English are seeking and searching for work – we get a lot of people emailing us asking where they can find job vacancies in Benidorm, Calpe, Torrevieja, Alicante, Malaga, Murcia, Marbella, Fuengirola, Benalmadena, Estepona, Torremolinos, Madrid, Barcelona, Seville, Valencia, Lloret de Mar and Tossa del Mar. These areas are the most popular for expat jobs, so look for jobs in Costa Blanca and jobs in Costa del Sol where most expats live. Also look at the slightly less popular areas of Costa Brava, Costa Almeria and Costa de la Luz and many people live in Spain but go across the border into Gibraltar each day to work. Other typical jobs for English speaking people you are likely to find would be jobs that cater to the large expat population in Spain, these include: pool cleaners, translators, beauty therapists, interior designers, singers, dancers, entertainers, gardening jobs, villa cleaning jobs, bar jobs and bar work, hairdressing jobs, shop assistants, cashiers and retail work in English and British goods shops, graduate jobs, taxi service, driving jobs including removals, restaurant jobs such as chefs, waiters and waitresses, fitness jobs, beautician jobs, pet care jobs, personal trainers, health care assistants, voluntary jobs at charity shops, computer services, business services such as graphic design, computer repair, contractors, babysitting, nanny jobs, au pair jobs, child care jobs, carer jobs, housekeeping, finance jobs, security jobs, accounting jobs, mechanics, insurance sales positions, hospitality jobs, customer service jobs, there are many English newspaper and magazines requiring writers and sales jobs in Spain etc – we hope this list gives you some idea of the types of jobs in Spain that are the most likely possibilities when you are job searching. There are now many expat radio stations and newspapers in Spain so these businesses are looking for media people as DJ’s, presenters, writers, journalists, web design, photographers and sales positions selling advertising space. One of the problems with jobs in Spain is the seasonal aspect – for example getting holiday jobs and summer jobs in Spain such as bar work in Spain or being a waiter or waitress is fine in the July and August but come October you may find you are out of a job! Still if you are a student these jobs could be great fun over the summer. Many of these jobs will be on a part time basis. Have at least six months money as savings to live on while you try finding work in Spain. Learn as much Spanish as possible BEFORE you move to Spain as this massively increases your chances of finding job opportunities. Jobs for English speakers are limited so be prepared to turn your hand to anything to get a foothold in Spain and accept any jobs that are available. Be prepared to work much longer hours as jobs in Spain start earlier and finish later. If you are looking for work in Spain for English speakers be prepared to work for a lot less than you are used to as wages, job benefits and perks are much lower in Spain. Learn a new skill, especially something practical and use it to get a job or start your own business. If you have a skill or vocation, consider starting your own business in Spain, then you are in control. Also consider working from home. Most expats end up self-employed (becoming an autonomo) in order to earn enough money to survive in Spain. You will find plenty of professional jobs advertised on websites such as ours. Sadly, for most of the tourism jobs you will actually need to be here in Spain in the resorts and ask around going from bar to bar or from restaurant to restaurant in order to find work. Costa Blanca News (English expat news). El Pais (national Spanish newspaper). Empresas de Trabajo Temporal (ETT) are recruitment agencies in Spain – mostly work of a temporary contract nature. Mostly professional and admin vacancies. Global jobs website Monster has a specific Spanish online version. Info Jobs – Website with thousands of Spanish jobs online. InfoJobs is the leading online job opportunities in the Spanish market, both for the number of visitors to its website and the volume of jobs listed. Experteer.es – Spain’s leading job search site for executive jobs, director jobs, Spain recruitment, bank jobs, IT jobs and travel jobs starting from €60,000. Experteer also offers access to executive headhunters, the highest paid jobs and job vacancies. Below we have the very latest job vacancies in Spain. This page is updated frequently – be sure to bookmark this page and keep coming back to see if your dream job in Spain has been listed here below. If you are an employer then the good news is that on our website we are currently accepting job listings in Spain, completely free of charge. If you need staff or have situations vacant then let us help you fill these positions. We have people on our mailing list who are ready and waiting to hear about your vacancies. These are people who have given us their email address and telephone number and who have opted to receive email job alerts. We have literally hundreds of people who wish to work in Spain and find jobs. While we accept your listings for free we do appreciate if you could help our site by either linking to us or Facebook liking us or tweeting us or social bookmarking our site. Your job adverts must be genuine and related to Spain. Does the position come with an official contract? How long is the contract or job for? Description of ideal candidate and qualities necessary. Ajeets Consultants is Spain’s leading recruitment services provider since 1991. Ajeets Group provides unique value to clients and candidates through a comprehensive suite of innovative solutions which cover an entire range of talent-driven needs from recruitment and assessment, training and development, and career management, to outsourcing and workforce consulting. With our cost-effective solutions and customized strategy we make a sense for specific needs and objectives of an organization, Our HR solutions provide an economical way to procure talent to your organization. I’m looking for a fully qualified experienced hairdresser, beautician and barber for a busy salon in Magaluf, Mallorca. It will be a commision based wage. The salon is usually fully booked in the summer so the opportunity to make extremely good money is available! Must speak English! Any Spanish is a bonus! My name is Tom. I am a 19 year old male currently looking for a summer job before I go to University to study programming in London. I am available for work 2017 from 10th of July till the 10th of September. I am fully fluent in English as well as Russian. I can also speak fluent Latvian if that is of any use. I am a 188cm tall and would like to consider myself attractive looking. I have worked in holiday industry before as a bartender/waiter and have enjoyed creating amazing memories and experiences with clients as well as working hard to make sure everything runs smoothly. Would love to have an opportunity to work in Spain. I have a CV and a Character reference from the largest holiday resort company in UK. I’m Christine from Newcastle, UK looking for work with accommodation in coastal areas of Spain for 2017. I am happy to consider work in exchange for accommodation and food! Hi , I have been living in Spain (Alicante province) for the past 12 month’s. I am a professional painter and decorator and looking for more work. I am also a qualified chef, I worked as a chef for several years after leaving the Royal Navy. I also have 25 years bar /restaurant experience, both as front of house but also running a busy food pub in Portsmouth, England. I have my own car and am willing to travel for work, I am also willing to work shifts etc. Did you find any painting jobs ? Looking to up stick with my partner for life in spain. Both late 40s , Disillusioned over 10 years service Police Officer with Financial and customer services background and Payroll administrator both out going and can turn our hands to anything . Please contact me for further details and interview. My name is Joel and I’m a Canadian citizen, but getting my EU citizenship in 2017, and I’m looking to move to Barcelona specifically. I’ve been involved in construction since 1999, having received a diploma in Construction Engineering in 2006, then I was Quality Control/Quality Assurance for a major concrete producer, responsible for overseeing 4 major plants. Since 2008, I owned my own firm undertaking Heavy Civil and Commercial projects, even Residential – specializing in concrete, but also carpentry, and many other facets of construction, from lifts to h/v/a/c systems, foreman, superintendent, engineer, to owner. I also hold certifications in many areas, like welding inspection, ultrasonic examination, and magnetic particle testing. I speak English and French fluently and am learning Spanish. Having said that, I would appreciate any advice you may have for me, or even employment/project bid work. My goal is to move there shortly and to raise my family there, and any kind of information or leads you may have would be a great start. We are young company based in Mallorca. We realize awesome programs and mix Spanish course with summer jobs. You can join one of our programs, start to speak Spanish and be ready for any interview. We also provide Nie and SS number service and find you a job. You can register now for season 2017! We start from 3.6.2017. Please contact me to creative-spanish@hotmail.com or check our web page funnyspanish.com. I am a fully qualified British driving instructor. My husband and l and our 12 yr old daughter have moved to Fuengirola in November this year. My husband is currently working and the plan was for me to stay at home, but after 6 week’s I’m getting very bored. I would ideally like to start teaching driving again here in spain, as that’s my choosen profession. I have contacted a few driving school here but to no avail. I am open to any offers of work but don’t speak Spanish, Only English. I am David, 25 years old living in Valencia. I am fun and energetic! I have a Bachelor Degree in Marketing from RMIT University of Australia. I also speak native English and Mandarin Chinese. I’m looking for any relevant position regarding Marketing or even teaching schools here in Valencia. I have experience in the advertising sales industry. Hi Jonathan I work for The Good Care Group and we are looking for experienced carers to work in the UK as a live in carer on a shift pattern such as 2 weeks on 2 weeks off. This works really well for people who live in here in Spain. What type of care work have you done before? I am Julia and just about to finish my International Business Management Master Program in Finland. I am originally German but studied my Master abroad. I have a Bachelors degree in Mechanical Engineering and would like to start work as a sales representative in the Málaga area. If you know anyone or someone who is hiring please contact me!